Citizen science is the term for scientific projects in which the average citizen can take part. The project itself is set-up and monitored by professional biologists and scientists but much of the field work contribution, in the form of collected data, comes from ordinary citizens. Although their roles may be significantly different, both the scientist and the citizen are equally important to the success of a citizen science project. The role of the scientist is to design the project according to sound scientific principles and to monitor the program as well as analyze the data and interpret the results. The scientist is, thus, the garantor of the scientific validity of the project. For their part, the citizen volunteer does not need a scientific background or years of extensive training in research methods, because that is taken care of by the project scientist. However, most projects are run by just a few researchers, and sometimes by only one principle scientist. And the scope of their project is such that without the aid of other people to gather the data, the scientist would not be able to gather enough data on their own for the project to succeed. This is where the citizen scientist comes in. They are the people out in the field, sometimes from all across the continent, watching the birds, taking notes, collecting data and sending that data to the project scientist. The collected data of just one citizen scientist may not be enough to determine any viable conclusions or even warrant analysis. 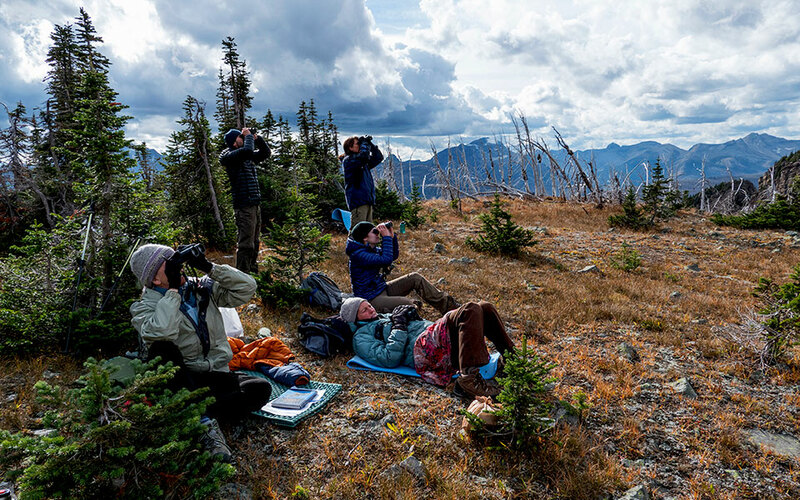 But combined with the data from dozens, often hundreds, of other birdwatchers, the contribution of citizen scientists far exceeds the output possible by the efforts of the much smaller number of professional biologists and scientists. The skill level required of a citizen scientist depends largely on the type of project they are interested in working on. The Great Backyard Bird Count is an effort to determine the distribution of bird species across North America. As such, the required skill level is the ability to identify the birds which visit their backyard bird feeder. The time commitment is only a few minutes per day for a short period in March, enough to get a good idea of the number of birds of each species which are using their feeder. This is a very successful project because many people from across North America participate, sending their data to the Cornell Laboratory of Ornithology, which publishes the continent-wide results on their website. An example of a citizen science project which requires more skill and commitment is the Breeding Bird Survey. In this project, experienced birders are required to survey a pre-determined route (sometimes several routes) during the months of May and June each year, and be able to identify any bird they encounter along that route, either by sight or by sound. This requires a high level of bird identification expertise, as well as the ability to follow a pretty specific field survey protocol. The results are analyzed and published by American and Canadian federal wildlife agencies, and they show the population density and distribution of breeding birds across North America. There are many citizen science projects in which you can participate. Some require a significant commitment of time and a high level of expertise. But most projects will take only a few hours of your time during the year and can be done by people with only beginner or intermediate levels of birdwatching skill. Of course, you may wish to contribute to more than one citizen science project, a fact which will endear you to many over-worked and under-funded scientists. Another benefit of citizen science projects is the opportunity to meet others involved with the same project. This gives citizen science projects a double-edged sword; you can learn a great deal about birds from other, more experienced participants, and working on some projects is as much a social activity as a scientific one. Many long-term friendships have been born from just such an endeavour.